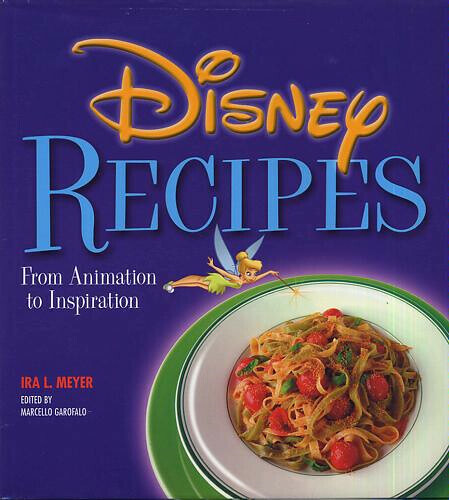 Description (from front flap): From short movies to full-length feature films, characters from the great Disney movies are often seen sipping soups, consuming cakes, or sampling any number of gastronomic delights. One hundred and one delectable recipes, based on favorite food scenes from the films and created by award-winning chef Ira Meyer, are collected in this colorfully illustrated cookbook. Savor Mulan's Mahogany Chicken, Lady and the Tramp's Spaghetti Bella Notte, Captain Hook's Codfish Fillets, Snow White's Gooseberry Pie, and many more inventive and unique recipes. GMD mention: Page 29 features Basil's Smoked Salmon Tartare. Copyright © 2003 by Disney Enterprises Inc.